As a child I could walk on the ceiling, I'd butterfly up on the wall. Outside butcher shops I would weep. As a youth I would read Dostoevsky, diversifying into James Joyce, Gurdjieff, Kierkegaard and the works of Krishnamurti. I danced myself right out the womb. Is it strange to dance so soon? To dance yourself into the tomb? What good it does to read such books at such a tender age I really don't know, though I'm sure it marks you for life. Is it wrong to understand the fear that dwells inside a man? I'm glad I read these books, however, for if we do indeed pass through this sphere of existence only the once then it's good to at least cast an eye over genius whilst we're here. Don't you think? Though I hasten to add: genius is, of course, in the eye of the beholder. I say this because when reading these kind of books as a teenager all I wanted to do was to discuss them with others, to swap thoughts and ideas with people who had read them too. Growing up where I did, unfortunately there was no-one or at least no-one I knew of at that time. It seemed that down the pub Dostoevsky at best might be thought of as a type of vodka and genius was getting away with claiming the dole and a slew of other benefits whilst working full-time for your cousin. But then in hindsight, perhaps we were all secretly reading Dostoevsky but no-one dared admit it for fear of ridicule and accusations of pretentiousness? Who knows? So, there we all were then, probably: taking drugs and stealing cars and doing whatever normal teenagers do, then going home and reading Dostoevsky. And to what end? So that we may understand something of the world? To raise our consciousness? To become a better breed of Tory voter? Woe unto to the person who identifies with the voice of the unnamed narrator in Dostoevsky's Notes From Underground for this is not a voice to identify with. It's a voice dredged up from the depths of the human psyche. A voice from deep, deep within. A voice, as Dostoevsky puts it, from under the floorboards. A voice from a soul spinning ceaselessly on an axis of perpetual nothingness. The first half of the book - entitled 'Underground' - is a monologue, delivered by one who will not be pinned down and who insists on his freedom even if that freedom will do him no good. He argues against all those who think they know something of the world then argues against himself too and it's here where the genius of Dostoevsky can be seen, for if - as the narrator suggests - the world is wrong then so too is he because even though he has set himself apart from it, he is still a part of it. Consciousness is both a curse and a blessing, and if two times two equals four as logic dictates then it's not good enough because man is beyond logic. If the world can be explained by a formula then what this will lead to is a crystal palace that - man being man - will ultimately be smashed simply for the sake of being able to do so for man is also a lover of destruction and chaos. If the creation of a crystal palace is the ultimate goal of man, what after this? To sit there in silence? The cessation of having a reason to exist? Is this consciousness? Or is consciousness ultimately higher than two times two? Is consciousness higher than a formula? The logic of two times two or the assertion that man will only strive for what might be of profit or of benefit to him in some way or another is the equivalent of a man filling a cup with water from the sea then holding it up and declaring "Look! There are no such things as whales living in the sea!" Dostoevsky lets us know how little we know. The second half of the book - entitled 'Apropos Of The Wet Snow' - is the story of the same unnamed narrator in his younger days and his constant loathing of the world and himself. Essentially he's bipolar, one moment praising himself as a genius amongst lesser mortals then the next despising himself as being worthless and lower than an insect. If it wasn't so tragic it would be comical and vice versa. "This isn't literature," he states "but corrective punishment." Maybe lithium might have helped? The story ends with the narrator declaring that "we've all grown unaccustomed to life, we're all lame, each of us more or less. We've even grown so unaccustomed that at times we feel a sort of loathing for real 'living life', and therefore cannot bear to be reminded of it. We don't even know where the living lives now, or what it is, or what it's called." Who knows what he would have made of today's world because if he thought things were bad then, he'd be dumb-struck with horror now where shopping seems to be the reason why people think they're here on Earth. According to Lenin, Dostoevsky was a 'superlatively' bad writer but as I said, genius is in the eye of the beholder. Notes From Underground was written in 1864 which was some time before the term bipolar was even thought of let alone explored and written about. Dostoevsky is the touchstone for many of the best writers ever: Hermann Hesse, Knut Hamsun, James Joyce, Nietzsche, Kafka, Ernest Hemingway, Albert Camus, Henry Miller, etc, etc. Without him none of these writers would have ended up writing the books they did. 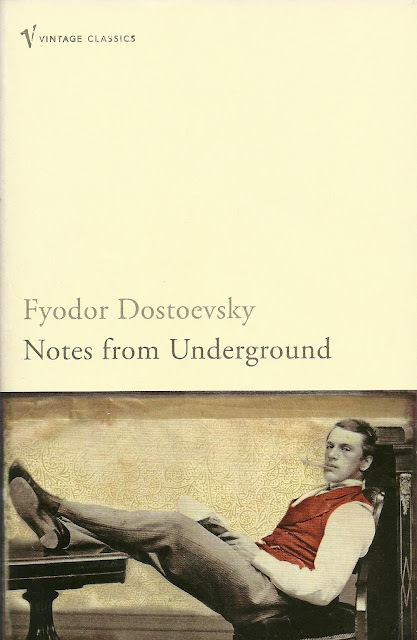 Paradoxically, however, I wouldn't advise everyone should read Dostoevsky because I think he's a writer that should be arrived at through your own volition. He's someone you should actually want to read and not because you think you should or because he's been recommended.